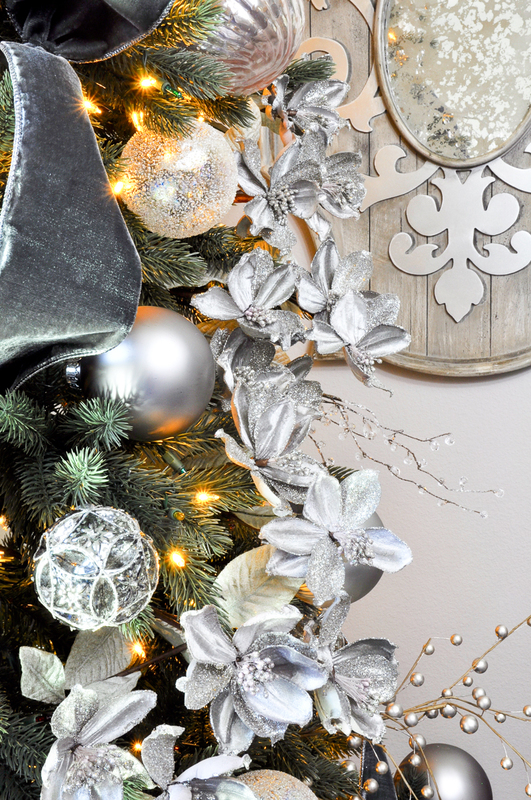 Welcome to Decor Gold Designs! 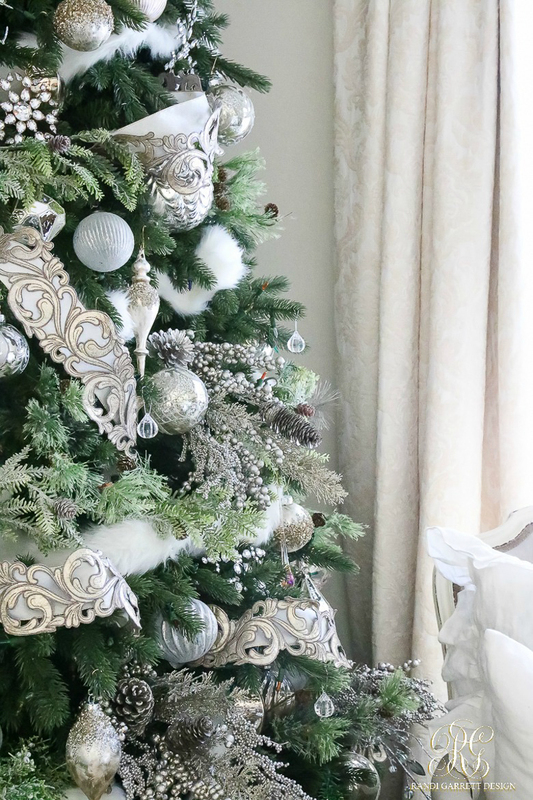 Today, I am thrilled to be sharing two brand new stunning Balsam Hill Christmas trees with you. 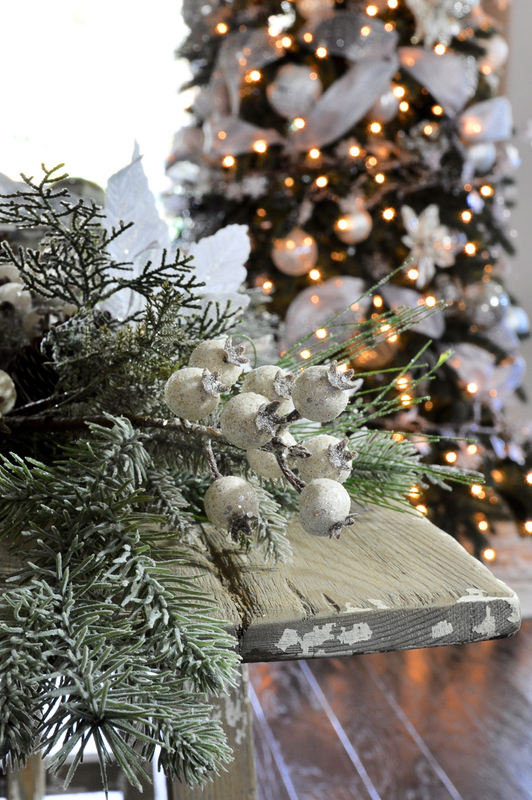 I have teamed up with three other bloggers: Randi Garrett Design, Citrine Living, and Kelley Nan. 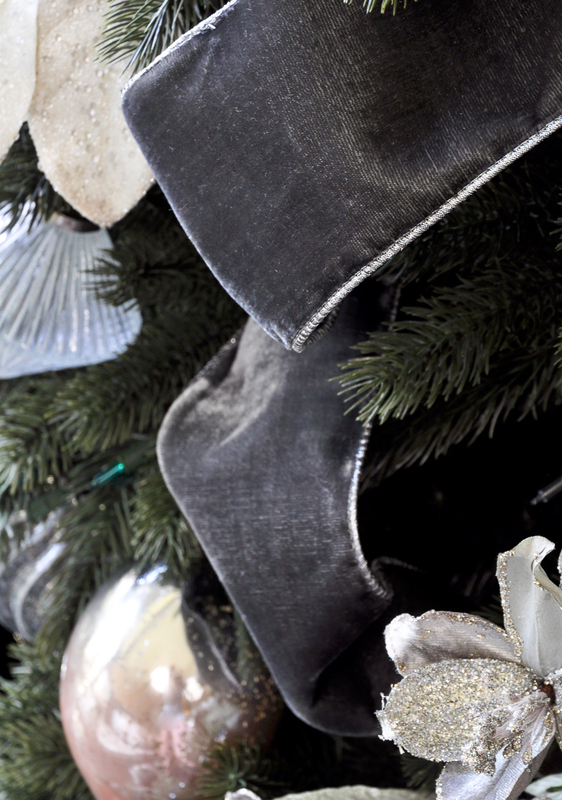 Therefore, you will be able to enjoy eight fully decorated Christmas trees. If you are coming from any of the other sites, I’m so glad you are here! First, I should point out that my two Christmas trees are identical. One is fitted with LED lights while the other has incandescent lights. 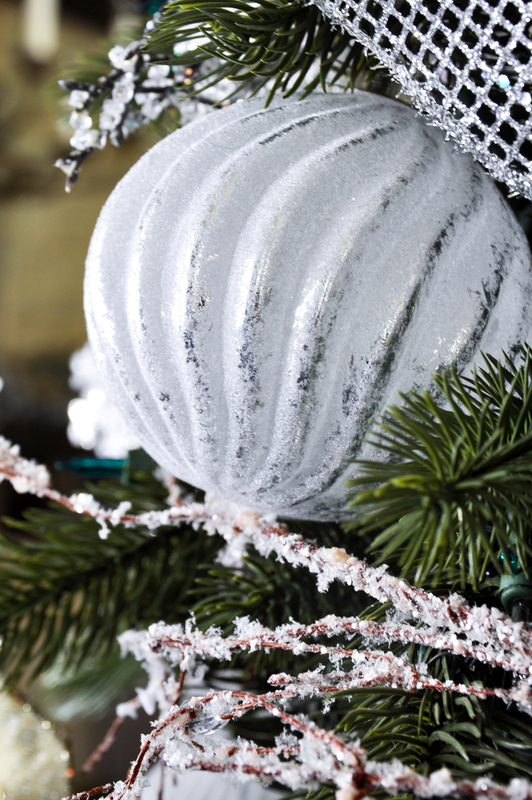 For the tree variety, I chose the Vermont White Spruce Narrow in a height of nine feet. 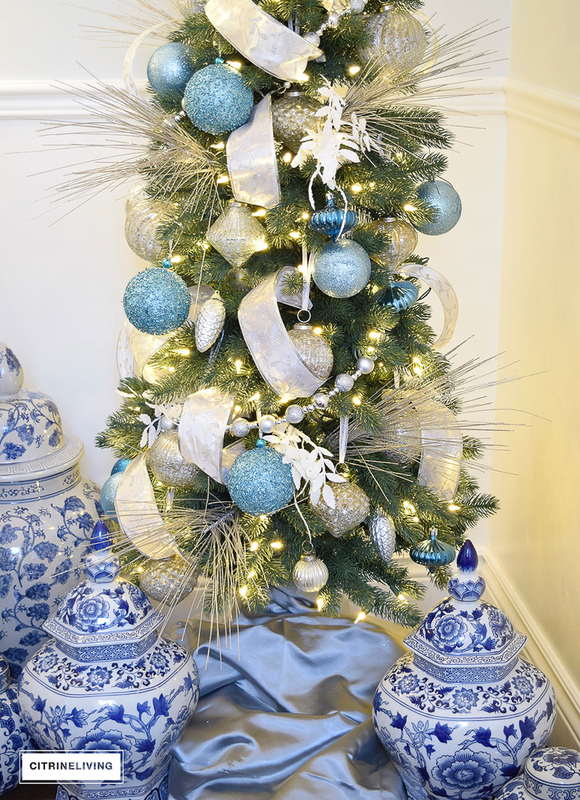 It’s important to ensure the dimensions of the space you are planning to use will accommodate the tree you select. 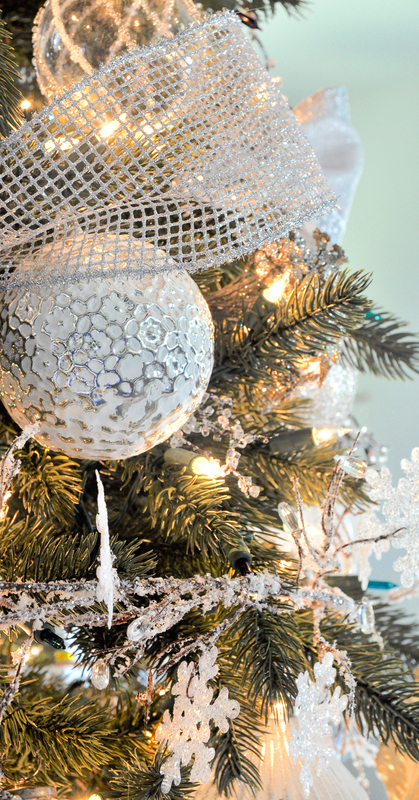 I chose to use the incandescent tree in my living room. The set-up is very simple. 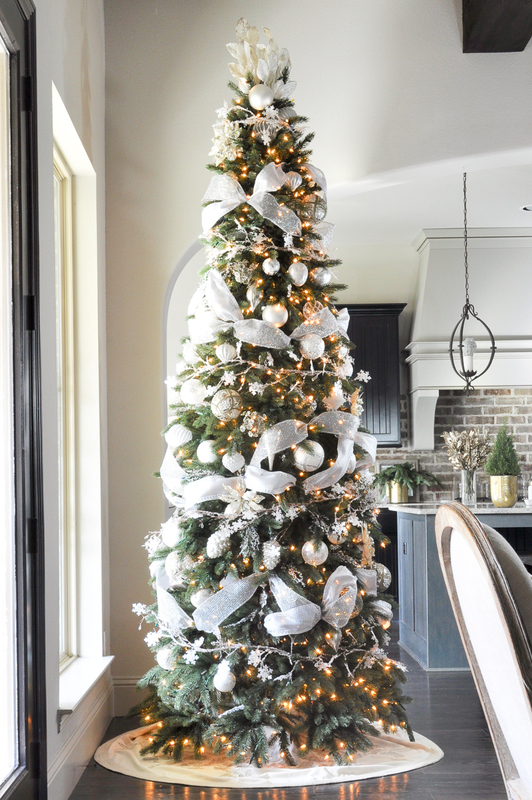 The tree arrives in two boxes which makes it much easier to maneuver through your home upon arrival. If it is a pre-lit version like these, as you slide each section into the other, the electrical connection is made. This eliminates having to look around for the correct plug-in within the branches! 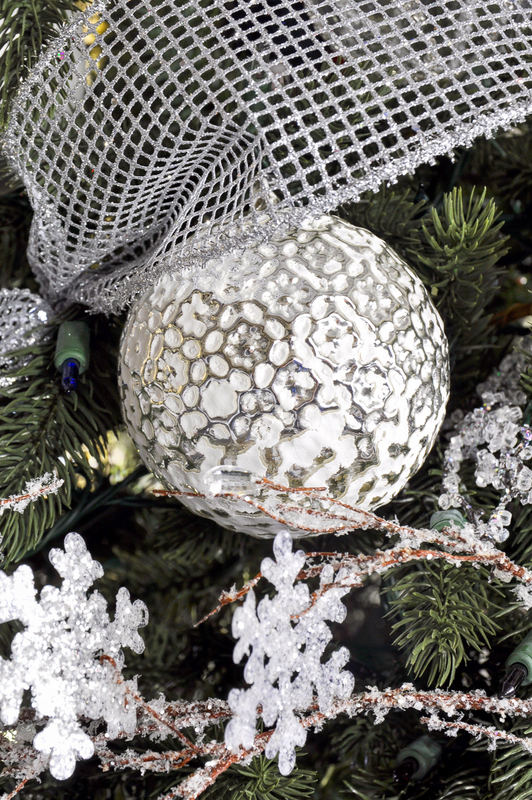 This tree is adorned with white and silver ornaments and trimmings. 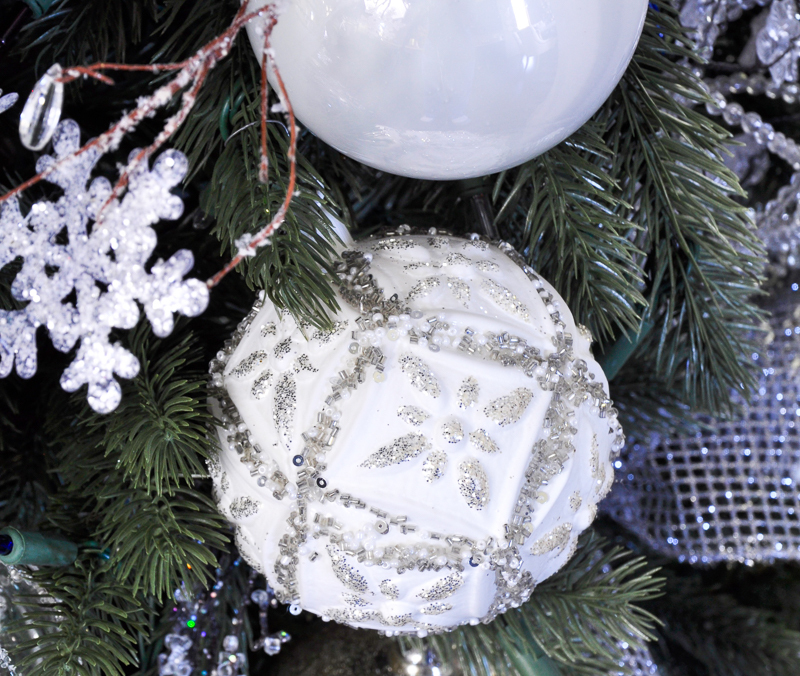 I’ve always wanted a white Christmas tree. There is a certain purity that comes with it. 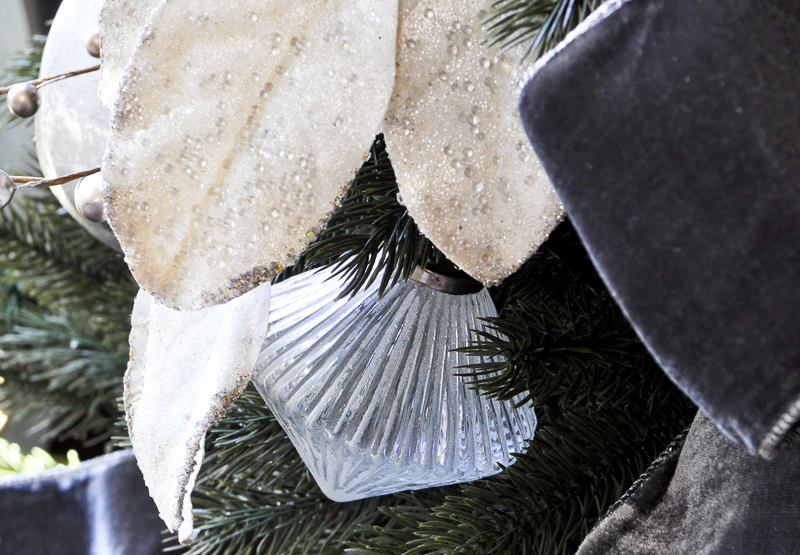 The ornaments I selected are all white, silver, and clear (I used similar ones on my mantle as well). 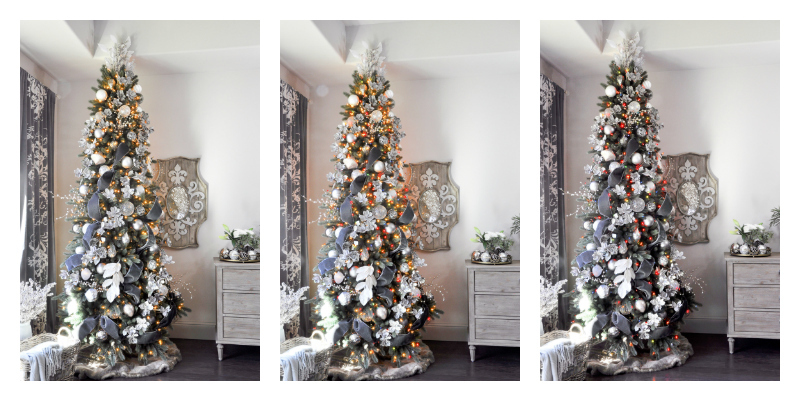 Now, I’d like to share the different lighting options featured on my Christmas trees: clear, all lights, and multi. This feature is called Color + Clear. Each option is selected via a very user friendly remote control. There is an independent button for each setting, plus an ‘off’ button. I just love this feature because my kids are crazy about the multicolor lights while I prefer the clear ones. My second tree is in my master bedroom and it looks right at home in this cozy little corner. I love how in the evening the room is totally embraced by its warm glow. This tree features LED lighting. 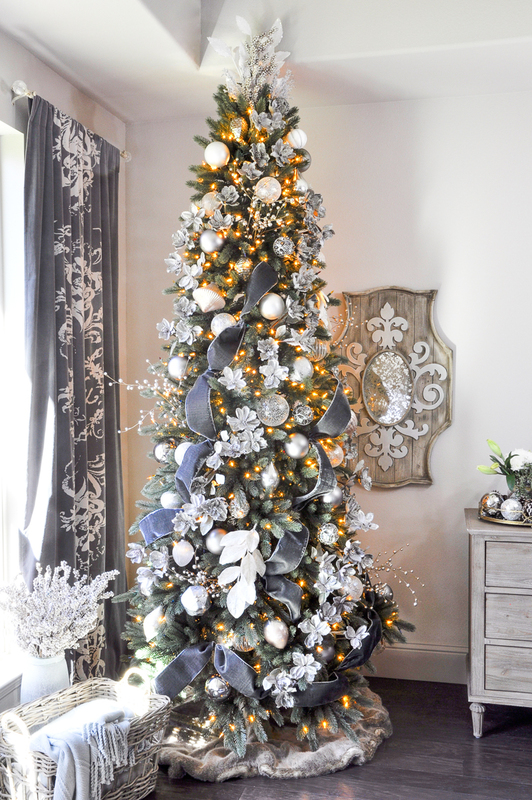 My bedroom tree from 2015 can be viewed here. The new tree is so much more fitting for this space. 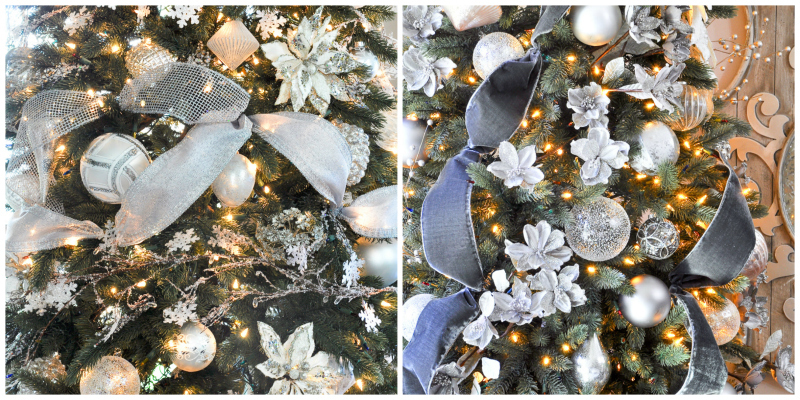 While the ornaments are still predominantly white, on this tree I wanted the ribbon to accent the grays within the room. I also used magnolia sprays in gray. But, rather than dispersing them randomly throughout the tree, I added them in rows. I love the result. 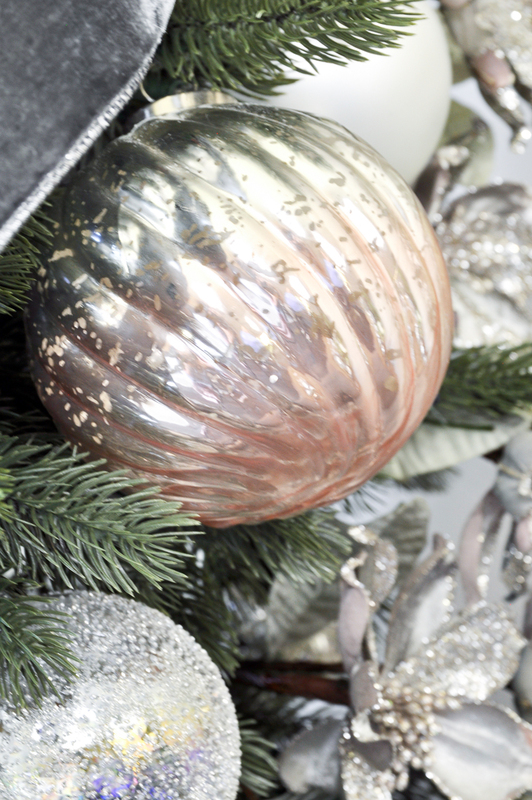 The texture of the ornaments provide a nice contrast to the ribbon. Shown below are the light options on my second tree: clear, all lights, and multi. Now, the big question: should you select incandescent or LED lighting? From a visual perspective, there is hardly a difference in my opinion. Older versions of LED lights were certainly dimmer than their more modern counterparts produced today. As a reminder, the LED lights are on my bedroom tree which is pictured on the right. LED lights have a much longer lifespan, by as much as 4-7 times. This may simply come down to personal preferences and lifestyle. Personally, I would probably lean towards the LED version if I were needing to choose a lighting style. The technology has come a long way in recent years regarding their brightness. I also appreciate the increased life span coupled with the reduced energy bill. 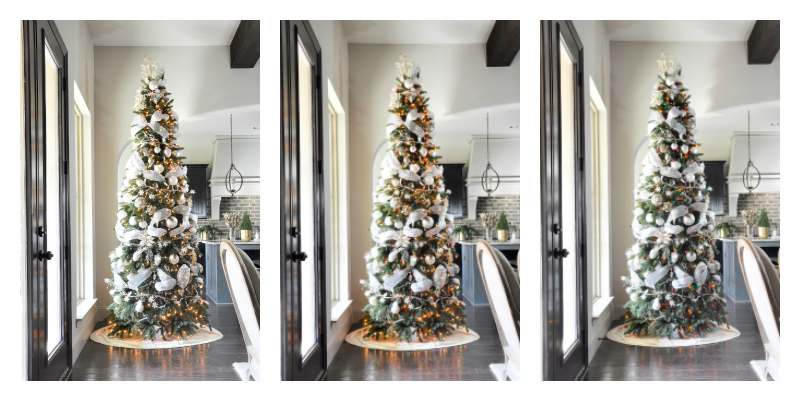 So, as you begin considering how many rooms in your home will host a Christmas tree, be thinking about the scale of the space and which lighting variety makes sense for you and your family. 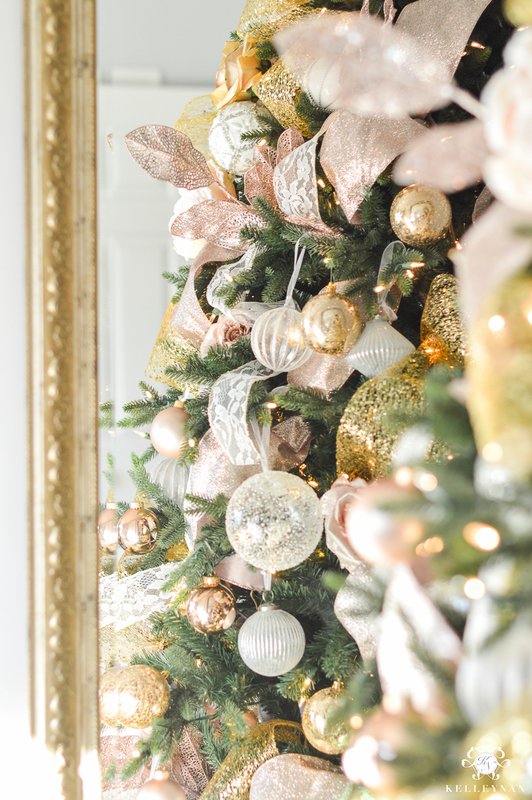 If you’d like to see more of my Christmas posts, please consider subscribing to my weekly newsletter. You can also find me on Pinterest, Instagram, and Facebook. Happy Holidays! 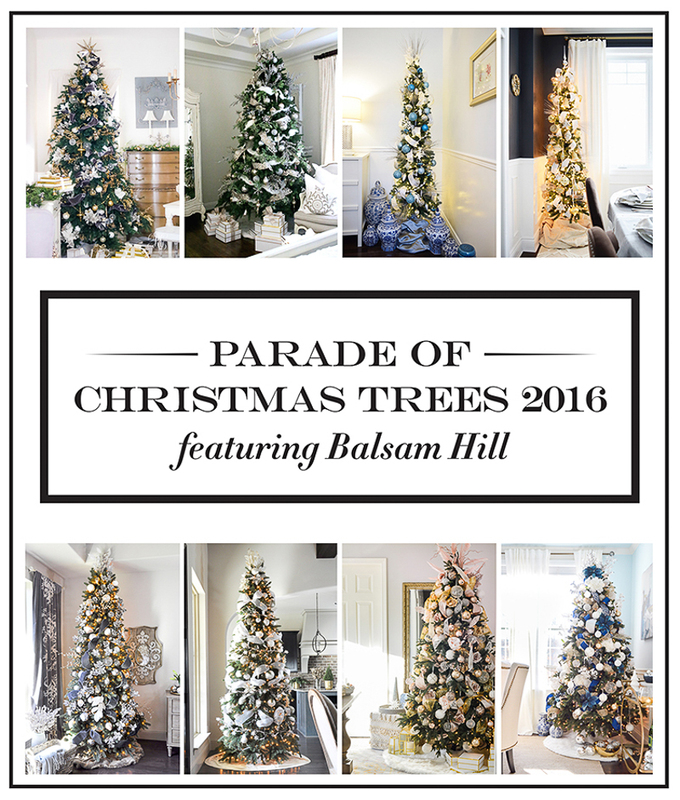 A special thank you to Balsam Hill for sponsoring this post. *While this post was done in partnership with Balsam Hill, the opinions expressed are 100% my own. Thank you so much Tam! I enjoyed it too!!! It’s always so much fun to get to do stuff like this with you! Thank you!!! Glad I got the shot for you! Love ya!!! Thank you Summer! Merry Christmas to you as well! Thank you! That ribbon had me at hello! It would look amazing in your beautiful, newly updated master bedroom too!